Representatives from Nissan visited Bobit Business Media (BBM) offices Wednesday to discuss the company's latest passenger and cargo vans. During the press event, Tim Gallagher, Nissan’s North American communications manager, and Dan Passe, senior manager for product communications, explained how the Nissan NV Passenger Van, which joined the Nissan Commercial Vehicle lineup in spring 2012, has already made an impact in the passenger van market. The vehicle has quickly become a favorite for personal and fleet use alike, according to Passe. Key vehicle features include integrated shoulder belts for each passenger seating position, bumpers set at car height for better protection for vehicle occupants and 14-inch brakes — the largest in its class. For 2014, the NV Passenger Van design features 12-person seating capacity with up to 324 possible seat configurations, along with roof-mounted curtain supplemental air bags for side-impact and rollover head protection for all outboard passengers, and standard head restraints and integrated seat belts for all rear seating positions. Unique details include the large center console with storage for a laptop computer and charger, hanging files and available 120V outlets. The NV Passenger's utility is also enhanced through features such as a low step-in height, easy ingress and egress without intrusive seat belts (integrated into rear seats), wide door openings and rear 50/50-split French doors for easy cargo and luggage loading. Standard items include a rear HVAC system with dual rotating vents for each row, an available 3rd row 12V outlet, available 120V outlet in cargo area and numerous cupholders and bottle holders through the spacious cabin. The Nissan NV Passenger Van is built on a foundation of a rugged heavy-duty, fully boxed ladder frame. It is offered in a choice of two engines – a 261-horsepower DOHC 24-valve 4.0-liter V6 with 281 lb-ft of torque or a 317-horsepower DOHC 32-valve V8 with 385 lb-ft of torque. The Nissan NV Passenger is offered in three well-equipped models, the NV3500 HD S, the NV3500 HD SV, and NV3500 HD SL (V8 engine only). The vehicle is assembled in Canton, Miss. 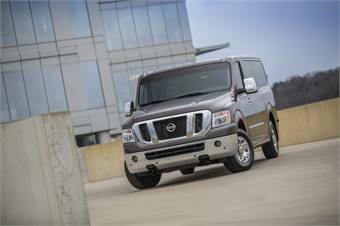 and available through a select network of more than 350 certified Nissan Commercial Vehicle dealers nationwide. For updates and more information, please go to www.nissancommercialvehicles.com.